The invention discloses a ranking and searching method and a ranking and searching device based on interpersonal distance. The method comprises the following steps of: acquiring each object requested to be queried through a ranking server according to a query request initialized by a user terminal, and acquiring a reference user group which corresponds to each queried object; acquiring the interpersonal distance from each user in the reference user group to a user who initializes the query request, and acquiring an evaluation value of the object requested to be queried by the user in the reference user group; and determining a user relationship dimensionality ranking index of each object according to the acquired interpersonal distance and the evaluation value, and ranking each object according to the user relationship dimensionality ranking index of each object. Compared with the prior art, the embodiment has the advantages that the ranking server carries out ranking according to the length of the interpersonal distance between the user and the reference user and the evaluation value of the reference user, and reference value of the social circle selection of the user on the selective shopping of the user is quantized, so that a ranking method based on user characteristics is provided. 本申请涉及计算机及互联网技术领域，尤其涉及一种基于人际距离的排名、搜索方法和装置。  The present application relates to computer and Internet technologies, and particularly to a ranking based on the interpersonal distance, search method and apparatus. 用户在网络购物时，通常会以商品的排名作为参考来确定需要购买的商品。  the user when online shopping, often to rank commodities as a reference to determine the need to purchase goods. 目前的提供给用户的商品排名方式包括价格、地理位置、信用评价、销售量等。 Goods are ranked currently available to users, including price, location, credit rating, sales and so on. 然而这些排名方式不一定能够使得用户很快搜索到自己想要购买的商品，因为商品是否适合一个人，不仅仅是简单的价格问题，也不仅仅是信用评价的问题，虽然信用评价从一定程度上反映了商品的质量好坏，但是不能确保信用评价高的商品就是用户喜欢的商品。 However, these are ranked so that the user may not be able to quickly search for the goods they want to buy, because the commodity is suitable for a person, not just a simple question of price, not just the issue of credit rating, although to some extent from credit rating It reflects the quality of goods is good or bad, but can not ensure a high credit rating is the user of goods favorite products. 除了价格和信用评价等参考因素外，用户的性情爱好也是决定某个商品是否是用户优先选择的参考因素。 In addition to the reference price and credit evaluation factors, the nature-loving users also decide whether a product is a reference factor user preference. 目前的商品排名方法仅仅考虑价格、信用等因素，无法将用户的性情爱好等因素也考虑在内，无法提供结合用户特性的排名方法，使得用户很难快速获取期望的搜索结果，用户需要较多次数的搜索，搜索时间较长，同时增加了网络通信的负担，增加了服务器的处理量，降低了服务器的处理性能。 The current commodity ranking methods only consider the price, credit and other factors, not the user's loving temperament and other factors into account, can not provide ranking method combines user features, allowing users is difficult to quickly obtain desired search results, the user needs more number of searches, the search time is longer, while increasing the burden of network communication, the server increases the amount of processing, reduces the processing performance of the server. 另外，用户和商家的熟悉程度也会影响用户选择商品时的决策，如果用户和商家有过成功的交易经历，或者用户的好友和商家有过成功的交易经历，那么相对于未和用户产生过任何关联的商家，该商家具有较大的概率成为用户的优选。  In addition, user familiarity and businesses will also influence decision-making when the user selects a product, if consumers and businesses have had a successful trading experience, or the user's friends and businesses have had a successful trading experience, not so with respect and generating any user associated with merchant, the merchant has a greater probability that the user be preferred. 而现有的网购平台中，仅根据商家的过往交易记录对商家进行信用评价，但是如果用户和该商家的过往交易成功的用户具有差异很大的购物习惯或性情爱好，则用户依然不会优先选择该信用评价很好的商家，因此，现有的基于商家的过往交易记录的评价和排名方法无法结合用户特性进行评价和排名。 The existing online shopping platform, only the merchant credit evaluation based on past business transactions, but if the user and the business success of past trade users have very different temperaments shopping habits or hobbies, then the user is still not a priority select the credit rating good business, therefore, existing businesses based on past transaction history of the evaluation and ranking methods can not be combined with the user characteristics were evaluated and ranked. 现有的评价和排名方式无法结合用户特点进行处理，使得用户难以快速获取期望的搜索结果，户需要较多次数的搜索，搜索时间较长，同时增加了网络通信的负担，增加了服务器的处理量，降低了服务器的处理性能。 Existing evaluation and ranking methods can not be combined with the user characteristics for processing, making it difficult for users to quickly obtain search results desired, the longer users need more number of searches, search times while increasing the burden of network traffic, increases the processing server amount, reduces the processing performance of the server. 本申请实施例提供了一种基于人际距离的排名方法和装置，用以解决现有技术中无法结合用户特性进行排名的问题。  The present application provides a method and apparatus based on a ranking of interpersonal distance, to solve the problem in the prior art can not be combined to rank user characteristics. 排名服务器根据获取到的人际距离和评价值，确定各对象的用户关系维度排名指数，并根据各对象的用户关系维度排名指数，对各对象进行排序。  ranked server according to the obtained value of interpersonal distance and evaluation to determine the dimensions of the relationship between the user ranking index of each object and relational dimension ranking index based on the user of each object, each object is sorted. 排名服务器根据获取到的人际距离和参考商家的评价值，确定所述参考商家的商家关系维度排名指数，并根据参考商家的商家关系维度排名指数，对参考商家进行排序。  Top server according to the obtained interpersonal distance evaluation values ​​of the reference and the merchant, the merchant determines the reference dimension ranking index business relationship, and dimensions in accordance with the business relationship ranking index reference merchant, the merchant reference sorting. 策略三，排名服务器根据上述基于人际距离的排名方法确定用户请求查询的各对象的用户关系维度排名指数，根据上述基于人际距离的排名方法确定所述各对象所在的商家的商家关系维度排名指数；排名服务器根据用户关系维度排名指数和商家关系维度排名指数确定各对象的综合指数；或者，根据用户关系维度排名指数、商家关系维度排名指数，以及网购平台维度指数，确定各对象的综合指数。  Strategy three, ranking server above to determine the user relational dimension ranking index of the objects the user requests a query based on a ranking method interpersonal distance based, the determination based on a ranking method interpersonal distance according to business relations dimension of the business of each of the object is located ranking index; ranking server ranking index and business relations dimension ranking index to determine the composite index of the objects according to user relational dimension; or, according to user relational dimension ranking index, the business relationship between the dimensions of ranking index, as well as shopping platform dimensions net index to determine the overall each object index. 排名服务器根据排序的结果，向发起查询的用户返回查询结果。  According to the ranking server to sort the results, return query results to the user-initiated query. 排序单元，用于根据获取到的人际距离和评价值，确定各对象的用户关系维度排名指数，并根据各对象的用户关系维度排名指数，对各对象进行排序。  The sorting unit according to the obtained interpersonal distance evaluation values ​​and determining the relationship between the user ranking index for each dimension of the object, and in accordance with user ranking index dimensional relationship of each object, for each object to be sorted. 排序单元，用于根据获取到的人际距离和参考商家的评价值，确定所述参考商家的商家关系维度排名指数，并根据参考商家的商家关系维度排名指数，对参考商家进行排序。  The sorting unit according to the evaluation value acquisition and interpersonal distance reference merchant, the merchant determines the reference dimension ranking index business relationship, and dimensions in accordance with the business relationship ranking index reference merchant, the merchant reference sorting. 策略三，排名服务器根据上述基于人际距离的排名方法确定用户请求查询的各对象的用户关系维度排名指数，根据上述基于人际距离的排名方法确定所求7-9中任一项所述的基于人际距离的排名方法确定所述各对象所在的商家的商家关系维度排名指数；排名服务器根据用户关系维度排名指数和商家关系维度排名指数确定各对象的综合指数；或者，根据用户关系维度排名指数、商家关系维度排名指数，以及网购平台维度指数，确定各对象的综合指数。  The three strategies, the above-described ranking server determines that the user ranking index for each dimension of the relationship between the user object requests a query based on a ranking method interpersonal distance according to the above-described method of determination based on a ranking of interpersonal distance according to the request of any one of 7-9 determined based on the ranking methodology interpersonal distance business of the respective object resides business relations dimension ranking index; ranking server ranking index and business relations dimension ranking index to determine the composite index of the objects according to user relational dimension; or, according to user relational dimension ranking index, businessmen relational dimension ranking index, as well as shopping platform dimensions net index to determine the composite index of each object. 本申请实施例中，排名服务器根据用户终端发起的查询请求，获取请求查询的各对象，并获取查询的各对象对应的参考用户群；获取参考用户群中每个用户到发起所述查询请求的用户的人际距离，并获取参考用户群中每个用户对所请求查询的对象的评价值；根据获取到的人际距离和评价值，确定各对象的用户关系维度排名指数，并根据各对象的用户关系维度排名指数，对各对象进行排序，相对于现有技术，本申请实施例的排名服务器根据用户和参考用户人际距离的远近以及参考用户的评价值进行排名，将用户的社交圈的选择对用户选择购物的参考价值进行了量化，提供了一种基于用户特性的排名方法。 Embodiment, the ranking server query request initiated by the user terminal  embodiment of the present application, each object acquisition request query, the query and obtains each object reference corresponding to a user group; each user group obtaining a reference to a user initiating the querying user request interpersonal distance, and obtains an evaluation value for each user object query requested with reference to the user group; according to the obtained interpersonal distance evaluation value, determining that the user relational dimension ranking index of each object, and according to various user relationship dimension ranking index object, for each sort objects with respect to the prior art, the ranking server according to embodiments of the present application are ranked according to the distance the user and the users of interpersonal distance and the reference evaluation value of the user, the user circles the choice of the user to select the reference value shopping quantified, provides a ranking based on user characteristics. 针对现有技术存在的问题，本申请实施例提供了一种基于人际距离的排名、搜索方法和装置。  for the presence of the prior art, the present embodiment provides an application based on interpersonal distance ranking search method and apparatus. 下面结合附图对本申请实施例进行详细描述。  Hereinafter, embodiments of the application described in detail in conjunction with the accompanying drawings. 本申请实施例提供的基于人际距离的排名方法通过用户的人际距离来量化用户特性对购物选择的影响。  The present application provides a method of ranking interpersonal distance based on characteristics of the user to quantify the impact cart interpersonal distance selected by the user. 用户所在的用户圈会对用户购物的选择产生影响，例如，用户及其好友相对于用户和某个陌生人，有更大的概率具有相似的性情爱好，而这些性情爱好会影响用户的购物选择，因此，可以通过用户的人际关系量化用户特性对购物选择的影响。 Users will ring the user where the user shopping options have an impact, for example, a user relative to the user and their friends and a stranger, there is a greater probability of a similar nature-loving, nature-loving these will affect the user's shopping options Therefore, the impact on user characteristics shopping options can be quantified by user relationships. 步骤101，排名服务器根据用户的商品查询请求确定查询商品群。  Step 101, the server determines the ranking queries commodity according to the commodity group query request of the user. 在步骤101之前还可包括，排名服务器接受用户通过所在终端发送的商品查询请求，其中携带商品描述信息，如商品类别信息、提供商品的商家信息，或商品标识信息（如商品名称或商品型号等）或其他相关信息中的一项或多项的组合，根据商品描述信息，排名服务器可以获取所有匹配的商品作为查询商品群。  may further comprise before step 101, the ranking server accepts merchandise query request sent by the user terminal is located, which carries the product description information, such as commodity category information, business information providing merchandise, or merchandise identification information (e.g., trade name or ) or other relevant information in one or a combination of many other types of goods, according to the product description information, the ranking server can obtain all products matching the query as commodity group. 根据现有搜索技术，当商品查询请求中关键词信息较多导致无搜索结果时，可以忽略其中的某项关键词信息，或采用类似的结果作为搜索结果。 According to the existing search technology, when a keyword query request product information results in no more search results, you can ignore a particular keyword information in it, or a similar result as a search result. 步骤102，排名服务器根据各查询商品获取参考用户群。  Step 102, the ranking server acquires the reference groups according to each user query product. 其中，排名服务器可以预先设定各查询商品和参考用户群的对应关系，并根据该对应关系获取参考用户群，预先为各查询商品设定参考用户群。  wherein each of the ranking server may be preset corresponding relationship between the query and the reference product user group, and user group obtaining reference according to the correspondence in advance with reference to the user group for the query set product. 或者，排名服务器根据各查询商品选取参考用户群，在选取参考用户群之前，还可包括，设定需要选取参考用户群的样本数。  Alternatively, the users select the ranking server group according to each commodity query, select the users in the group before, further comprising setting the number of samples required to select the users group. 该样本数可根据经验值由系统预设。 The number of samples can be preset by the system according to empirical values. 其中，参考用户群可以是购买了某项查询商品的已购买用户群。  wherein the reference group of users can be purchased commodities have purchased a particular query user base. 例如当参考用户群的样本数设定为100时，可以选取100个最近购买了该查询商品的用户作为参考用户群。 For example, when the number of samples is set to a reference user groups 100, 100 can select the query the user recently purchased merchandise as the users group. 可以设定参考用户群中的用户具有独一性，例如，该商品的最近10条购买记录的购买者为同一人，则认为只选取了一个用户，再另外选取其他99个不同的用户。 May be set with reference to the user in the user group has unique properties, e.g., the last 10 records of purchasers of the merchandise for the same person, is considered only a selected user, and then select another additional 99 different users. 其中，参考用户群也可以是对该查询商品表示了购买意愿的用户群，可以优先选择提供了购买意愿程度评价的意愿用户。  where users can reference a user group is a willingness to buy the merchandise to the query, you can choose to provide priority to the wishes of the user evaluation of the degree of willingness to buy. 在这种情况下，购物平台网站提供相应记录用户对商品的购买愿望的功能，并且提供购买意愿程度评价功能，例如用户可以选择1-10表示意愿程度，I到10表示购买意愿的逐渐增加。 In this case, the corresponding record shopping platform website provides user functionality that wishes to purchase goods, and provide purchase willingness evaluation function, for example, the user can select the degree of willingness to 1-10 represent, I represent 10 to gradually increase purchase intentions. 当参考用户群设定为意愿用户群，并且参考用户群的用户数设定为100时，选取100个最近提交购买该商品的意愿，并且提供了意愿值的用户作为参考用户群。 When the reference user groups to the wishes of users, user groups and user reference number is set to 100, select 100 recently submitted willingness to buy the merchandise and provides the user wishes of value as a reference group of users. 参考用户群还可以是上述已购买用户群和意愿用户群按照一定用户群样本比例的混合用户群。  Reference may also be a group of users have purchased the above-described user group and users in accordance with the wishes of the user population size in the sample mixing certain users. 例如，在选取的参考用户群中，设定用户群样本比例为6 ： 4，则选取已购买用户群的用户数占总用户数的60%，意愿用户群的用户数占总用户数的40%。 For example, the reference in the selected user group, users set the ratio of sample 6: 4, then select the number of users the user has purchased 60% of the total number of groups of users, the total number of users user group a user wishes 40 %. 步骤103，排名服务器向社交关系服务器发送社交关系查询请求，获取发送查询请求的用户到参考用户群中每个用户的人际距离。  Step 103, the ranking server sends a query request to a social relationship social connections server to obtain the user sends a query request to the users for each user group interpersonal distance. 人际距离用于描述用户之间的人际距离的远近。  interpersonal distance is used to describe the distance of interpersonal distance between users. 根据六度分割理论，一个人和任何另外一个陌生人之间所间隔的人不会超过六个，也就是说，一个人最多通过六个人就可以认识任何一个陌生人。 According to six degrees of separation theory, a person and any other person that elapses between strangers is not more than six, that is to say, a person up to six people can recognize any stranger. 社交关系服务器存储了好友关联体系中，每个用户及其好友关系。 Social relationships server stores a buddy system associated with each user and their friendship. 当采用好友关系来确定人际距离时，人际距离指是完全不同用户，在某个好友关联体系中，通过几个中间人才能够建立朋友关系。 When interpersonal distance is determined using the buddy relationship, interpersonal Distances are completely different users in a buddy system linked by several intermediate people are able to build friendships. 根据社交关系服务器提供的好友关系，排名服务器可以计算用户到参考用户群中每个用户的人际距离。 Social relationships based on friendship provided by the server, the server can calculate the ranking user to reference user groups each user's interpersonal distance. 例如，在某个好友体系中，一个用户A有好友B，则用户A和用户B的之间的人际距离为1，如果用户B有好友C，并且用户C不是用户A的好友，则用户A和用户C的之间的人际距离为2，依次类推。 For example, a buddy system, a user A has a friend B, the interpersonal distance between the users A and B is 1, if the user has a friend C B, and user C is not a friend of the user A, the user A interpersonal distance between the user and C is 2, and so on. 根据六度分割理论，两个用户之间的人际距离最远为7，此时两个用户之间所间隔的好友为六个。 The six degrees of separation theory, interpersonal distance between the furthest two to seven users, friends this time interval between two users is six. 上述好友关联体系可以是拥有用户，及用户的好友关系特性的平台。  The buddy system can be associated with the user owns the platform, and the relationship between the characteristics of the user's friends. 社交关系服务器可以是存储下列一个或多个好友关联体系的用户及其好友信息的服务器，例如，邮箱服务系统中的用户及用户好友关系；社交网络服务网站中的用户及用户好友关系；即时通信系统中的用户及用户好友关系；网络游戏平台中的用户及用户好友关系；基于用户关系的信息分享、传播以及获取平台中的用户及用户好友关系；或，电子商务网站中的用户及用户好友关系。 Social relationships server can be a server users and their friends information stored in one or more of the associated buddy system, for example, mail service users in the system and user friendship; social networking site users in the user's friends and relations; instant messaging user and the user's friends in a relational system; the relationship between the user and the user's friends network game platform; share information based on user relations, dissemination and access user and the user's friends relationship platform; or e-commerce website user and the user's friends relationship. 例如，在购物网站平台中，用户可以添加自己的好友，所有用户的好友关系在一起构成了一个社交网络。 For example, in the shopping website platform, users can add their own friends, friendship for all users together to form a social network. 或者，在邮箱服务系统中，邮箱用户有自己的通信簿或好友名单，所有的用户及其通信簿在一起构成一种人际网络，例如A的通信录中有（b，c，d) ;b的通信录中有（d，g，t，w)，这样A与b的人际距离就是I，A与w的人际距离就是2，对于A来说，距离是I的b比距离是2的w具有更近的人际关系。 Alternatively, the mail service system, the user mailbox has its own address book or buddy list, address book and all users together constitute a network of people, for example, in Appendix A has a communication (b, c, d); b address book has (d, g, t, w), interpersonal distance so that a and b is the interpersonal distance I, a and w is 2 for a, the distance is I, b than the distance w 2 of It has closer relationships. 上述好友关联体系可以是虚拟社区网络平台，或是即时通信系统，或者网络游戏平台等具有用户及用户的好友关系特性的平台。 Friends described above may be associated with a virtual community network system platform, or instant messaging system, or platform has a user and the user's friends relationship characteristics of online gaming platforms. 本申请实施例中，人际距离的值越小，表示两个用户的人际距离更近。  Example embodiment of the present application, the smaller the value of interpersonal distance representing interpersonal distance closer to two users. 人际距离可以设定取值范围为1-7。 Interpersonal distance can be set in the range of 1-7. 另外，考虑到并非所有的自然人都是某一个好友关联体系的使用者，因此，两个用户之间可能需要不止6个而是更多的人才能彼此认识，服务器在根据好友关系计算人际距离，如果经过一定时间或者运算量的搜索无法通过好友关系确定人际距离，则可以设定人际距离为特定值，例如10。 In addition, taking into account that not all the natural person is a friend of a user associated with the system, therefore, may require more than 6 between two users but more people can know each other, the server computing interpersonal distance based on friendship, If after a certain time or computational search interpersonal distance can not be determined by the relationship between friends, you can set the interpersonal distance to a specific value, such as 10. 另外，除了根据好友关系确定人际距离，也可以根据社交关系服务器能够提供的其他衡量两个用户之间相似度的信息来综合评定人际距离。  In addition to other measures of information to determine the similarity between two users based on interpersonal relations from friends, social relationships can also be based servers can provide a comprehensive assessment to interpersonal distance. 现有社交关系服务系统中，可以根据相同话题对用户进行凝聚、根据学习经历进行凝聚、根据周末出游的相同地点进行凝聚等，这些都是社交关系的一部分，提供了一种从好友关系之外的方式来衡量两个用户之间人际关系的远近。 Existing social relations service system, the user can be carried out according to the same topic cohesion, by coagulation according to the learning experience, according to the same place by coagulation weekend trips, etc., are all part of social relationships, a friend from outside the relationship the way to measure the distance relationships between two users. 具体的，可以设定若干个用户属性，评价两个用户在这些用户属性上是否具有共性，两个用户的用户属性的共性越多，人际距离越小，具体的，可以根据判断用户属性是否相同，对人际距离增加相应的权重使之变小。  Specifically, the user can set a number of properties, evaluated whether the two users on the user attributes in common, the more common two users of user attributes, interpersonal distance is smaller, in particular, may be determined according to the user properties are the same, an increase of interpersonal distance corresponding weights to make it smaller. 例如，设定5个用户属性，分别为：(kl，参加相同的聚会），（k2，喜欢相同的乐队），(k3，相同的大学），（k4，喜欢足球），（k5，话题关注相似度），基于用户属性评价的人际距离K = kl*k2*k3*k4*k5，如果某个用户属性相同，则相应的ki(ie [1,5])取值为O. 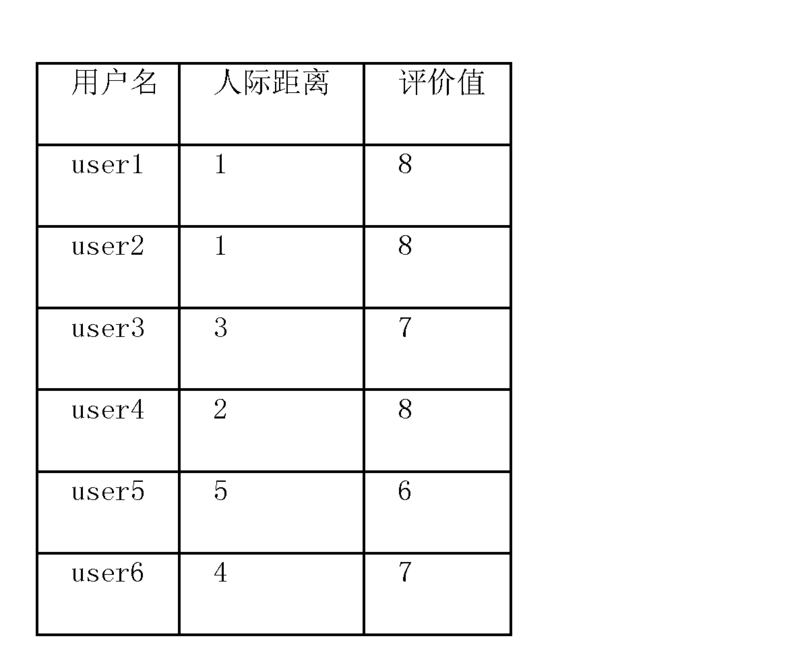 8，如果用户属性相同不同则ki取值为I。  For example, set 5 user attributes, namely: (kl, participate in the same party), (k2, like the same band), (k3, the same university), (k4, like football), (k5 , concerned about the topic similarity), based on user attributes interpersonal distance evaluation of K = kl * k2 * k3 * k4 * k5, if a user attribute identical, the corresponding ki (ie [1,5]) value of O. 8, if the user is different from the same property values ​​ki is I. 例如在好友关系的基础上，如果用户A和用户B，kl，k2，k3相同，k4, k5不同，则K = O. 8*0. 8*0. 8*1*1 = O. 512。 For example on the basis of the buddy relationship, if user A and user B, kl, k2, same k3, k4, K5 different, then K = O. 8 * 0. 8 * 0. 8 * 1 * 1 = O. 512. 上述具体的参数取值和公式仅为示范具体，本申请的技术方案不限于本实施例中的参数和公式的设定。 Specific values ​​of the above parameters and equation merely illustrative, the technical solution of the present application is not limited to the embodiment set parameters and formulas embodiment. 步骤104，排名服务器获取参考用户群中每个用户对该查询商品的评价值。  Step 104, the ranking server acquires user evaluation value for each of the users to the query commodity group. 如果参考用户群是已购买用户群，则评价值为参考用户群中用户对商品的评价，如果参考用户群是意愿用户群，则评价值为意愿用户群中用户对商品的购买意愿程度评价值。  If the reference is a user base of users have purchased, the evaluation reference value is the user group user evaluation of the product, if the reference user group is the will of the user group, the evaluation value of the wishes of the user group the user wishes to purchase goods degree evaluation value. 当参考用户群为已购买用户群时，某些已购买用户可能未提供评价，可以将这些用户的评价值设为一默认值；或者在选取参考用户群时，默认选取已经提供了评价值的已购买用户。  When the users have purchased the user group is the group, some users may not have purchased the reviews, the user can use these evaluation value is set to a default value; or when users select the reference, has provided a default selection evaluation of the value of purchased user. 当参考用户群为表示了购买意愿的用户群时，同样的，可以将没有提供了购买意愿程度评价值的意愿用户的购买意愿程度评价值设为一默认值；也可以设定默认选取表达了购买意愿并且已经提供了购买意愿程度评价值的意愿用户。 When a user group is a reference to a group of users willingness to buy, the same, can not provide the degree of willingness to buy the wishes of the user evaluation value of the degree of willingness to buy the evaluation value is set to a default value; you can also set the default selected expressed willingness to buy and have a willingness to provide the user evaluation value of the degree of willingness to buy. 评价值可以是用户根据系统给出的一个评分范围给出的一个打分，也可以由系统提供根据用户提供的“好中差”等级评价进行量化得到评价值。  The evaluation value may be a user according to a rating score given range of the system is given, the system may also be provided according to quantify "good in poor" rating provided by the user evaluation value for evaluation. 本申请实施例中，步骤103和步骤104不分先后顺序。  The application of the present embodiment, steps 103 and 104 regardless of the order. 步骤105，排名服务器根据参考用户群中每个用户的人际距离，以及参考用户群中每个用户对该查询商品的评价值，计算用户关系维度排名指数。  Step 105, the ranking server according to the user evaluation value for each of the users to the query commodity group interpersonal distance for each user, user group, and a reference, calculating a user ranking index relationship dimension. 用户关系维度排名指数=SUM(评价值(人际距离））/样本数，其中，f(人际距离）为根据人际距离计算得到的权重系数。  The user relationship dimension ranking index = SUM (evaluation values ​​(interpersonal distance)) / number of samples, wherein, F (interpersonal distance) is the weight in accordance with the calculated interpersonal distance weight factor. 如表I所示，为某个查询商品对应的用户参考群中的用户到发起查询请求的用户之间的人际距离以及对查询商品的评价值。  As shown in Table I, a query for the user's reference commodity group corresponding to a user initiated interpersonal distance between the user's query request and the query evaluation value commodities. 该用户参考群中的每个用户都是在该商家购买过该查询商品）的用户。 The user reference group for each user in the query are purchased in the commodity business) users. 根据表I中的数据，可以得到查询商品的用户关系维度排名指数为（8/1+8/1+7/3+8/2+6/5+7/4+10/3+9/2+6/4+8/6)/10 = 3. 495。  The data in Table I can be obtained query commodity user relationship dimension ranking index (8/1 + 8/1 + 7/3 + 8/2 + 6/5 + 7/4 + 10/3 + 9/6 + 2 / + 8 4/6) / 10 = 3.495. 类似的，对于其它查询商品以及对应的参考用户群，可以得到其它各查询商品的关系维度排名指数。 Similarly, for other commodities as well as the corresponding reference queries users can get relational dimension index ranking queries each other commodities. 根据商品类别信息查询到的对应查询商品通常为多个，针对其中的每个查询商品分别执行上述步骤102〜105，这样可以分别得到每个查询商品的用户关系维度排名指数。  The product category information query corresponding to a plurality of goods are usually query, the query for each product wherein the above steps 102~105, respectively, so that the user can obtain the relationship between the dimension index ranking of each query item, respectively. 步骤106，排名服务器根据查询商品的用户关系维度排名指数，对所有的查询商品进行排序。  Step 106, the top ranking index server based on the user query relational dimension of merchandise, sort all queries merchandise. 具体的，可以按照用户关系维度排名指数由高到低的顺序进行排名。  Specifically, the user can be ranked in order of descending ranking index relationship dimension. 用户关系维度排名指数为结合了人际距离的评价值的平均，相对于传统的评价值直接平均的评价方法，该评价方法对用户的好友圈的对商品评价的影响进行了量化，对于具有相同平均评价值的两个商品，如果其中一个用户关系维度排名指数较高，说明该商品更加受到用户的好友或用户所在的人际圈的好评，该商品更可能是提交查询用户希望看到的搜索结果。 Users relational dimension ranking index combines the average appraisal value of interpersonal distance, as opposed to traditional direct average evaluation method evaluation value, the evaluation method affects the user's friend circle for goods evaluation of quantified, for the same average evaluation of the value of two commodities, if a user relational dimension in which the higher ranking index, indicating that the product has been well received even more interpersonal circle of friends of the user or the user is located, the product is more likely to be submitted to the search query results users want to see. 上述流程的一种典型应用场景为：用户想购买手机，用户可向系统提交查询请求，查询词为“手机触屏”，系统根据该查询请求确定所有匹配的商品，假定匹配的结果包括500个商品条目，系统根据每个条目中商品的历史购买记录，确定该商品之前的100个购买者为参考用户群，根据该100个购买者到提交查询请求的用户的人际距离，以及该100个购买者对于该商品的评价，计算该商品的用户关系维度排名指数，分别计算500个商品的各自的用户关系维度排名指数之后，根据用户关系维度排名指数的大小对这500个商品进行排名。 A typical application scenario  The process is as follows: the user wants to buy mobile phones, users can submit queries to the system, the query word for "touch screen mobile phone", the system determines all matching merchandise according to the query request, assuming match result including 500 product items, the system purchase records based on history of each entry of goods, determined before the product 100 buyers as a reference group of users, according to the 100 buyers to submit queries interpersonal distance to the user, and after 100 buyers for the evaluation of this product, the user computing relational dimension of the commodity index rankings were calculated respective user relational dimension index ranking 500 items, depending on the size relationship between the dimensions of the user ranking index to rank these 500 commodities . 本申请实施例中，排名服务器根据用户发起的查询请求，获取请求查询的各对象，并获取查询的各对象对应的参考用户群；获取参考用户群中每个用户到发起所述查询请求的用户的人际距离，并获取参考用户群中每个用户对所请求查询的对象的评价值；根据获取到的人际距离和评价值，确定各对象的用户关系维度排名指数，并根据各对象的用户关系维度排名指数，对各对象进行排序，相对于现有技术，本申请实施例的排名服务器根据用户和参考用户人际距离的远近以及参考用户的评价值进行排名，将用户的社交圈的选择对用户选择购物的参考价值进行了量化，提供了一种基于用户特性的排名方法。  Example embodiments of the present application, according to the ranking server query request initiated by the user, acquiring each object query is requested, and acquires each object reference corresponding to a user query groups; obtain the users group to initiate the query for each user interpersonal distance of the user's request, and obtains an evaluation value for each user object query requested with reference to the user group; according to the obtained interpersonal distance evaluation value, determining that the user relational dimension ranking index of each object, and according to each object user relationship dimension ranking index, for each sort objects with respect to the prior art, the present application embodiment ranking server according to rank them according to the distance the user and the users of interpersonal distance and the reference evaluation value of the user, the user's circles select reference value shopping for user quantified, providing a ranking method based on user characteristics. 本申请实施例基于参考商家到用户的人际距离的远近和参考商家的评价值计算参考商家的商家关系维度排名指数，并基于商家关系维度排名指数对参考商家进行排名。  The present application distance and the reference evaluation value based on the reference merchant to merchant user interpersonal distance is calculated according to the reference embodiment merchant business relationship dimension ranking index and the reference index ranking listing rank based business relationship dimension. 步骤201，排名服务器获取用户通过所在终端提交的商品查询请求，根据其中的商品描述信息获取相应的各参考商家。  Step 201, the ranking server retrieves commodity query request submitted by the user terminal is located, according to the product description in which respective ones of the reference information acquired business. 步骤202，排名服务器向社交关系服务器发送社交关系查询请求，分别获取发起查询请求的用户到各参考商家的人际距离。  In step 202, the ranking server sends a query to the social relations of social relations server, respectively, to obtain a user initiates a query request to each reference interpersonal distance business. 用户到参考商家的人际距离可以根据和步骤102中类似的方法，根据用户和参考商家在社交网络中的好友关系进行确定。  user to the merchant reference interpersonal distance can and a method similar to step 102, and the reference is determined according to a user in the buddy relationship business social network. 用户到参考商家的人际距离也可以根据用户和参考商家的交易记录进行确定，例如，设定人际距离取值范围为I到7，如果用户和参考商家曾经有过成功的交易记录，用户到参考商家的人际距离取较小值1，如果用户和参考商家曾经有过失败的交易记录，用户到参考商家的人际距离取较大值7。  user to interpersonal distance reference business can also be determined based on transaction records user and reference businesses, for example, set the interpersonal distance ranges from I to 7, if the user and reference businesses have had successful transactions, users reference to business interpersonal distance 1 whichever is less, if the user and reference businesses have had a failed transaction, a user reference to interpersonal distance business whichever is greater 7. 具体可以根据交易数据库中记录的用户和参考商家的交易次数以及交易的成功率确定用户和参考商家之间的人际距离。 Specific determine interpersonal distance between the user and the user reference merchants and merchant transaction reference number of transactions recorded in the database and the success rate of transactions. 步骤203，排名服务器获取各参考商家的评价值。  Step 203, the ranking server obtains the evaluation value of each reference listing. 其中，参考商家的评价值可以根据现有的网络交易平台中评价商家的方法确定。  wherein, the evaluation value may be determined with reference to the merchant network according to the prior business transaction platform evaluated. 其中，步骤202和步骤203不分先后顺序。  wherein steps 202 and 203 regardless of the order. 步骤204，排名服务器根据各参考商家的人际距离，以及各参考商家的评价值，确定各参考商家的商家关系维度排名指数。  Step 204, the ranking of each server based on interpersonal distance reference businesses, as well as evaluating the business value of each reference, the reference to determine each business' relational dimension ranking index. 具体的，对于每个参考商家，其到用户人际距离越远，其评价值的参考度越低，相应的权重越低。  Specifically, for each reference listing that the user interpersonal distance farther, the evaluation of a low reference value, corresponding to lower the weight. 可以根据如下公式计算：商家关系维度排名指数=评价值/人际距离。  may be calculated according to the formula: Index = merchant ranking dimension relationship evaluation values ​​/ interpersonal distance. 步骤205，排名服务器根据各参考商家的商家关系维度排名指数，对各参考商家进行排序。  Step 205, the ranking server according to the dimensions of the business relationship between each reference merchant ranking index for each reference sorting business. 本申请实施例中，排名服务器获取用户提交的查询商品，根据所述查询商品获取提供该查询商品的参考商家；排名服务器向社交关系服务器发送社交关系查询请求，获取用户到参考商家的人际距离；获取所述参考商家的评价值；根据用户到参考商家的人际距离，以及参考商家的评价值，确定所述参考商家的商家关系维度排名指数；根据参考商家的商家关系维度排名指数，对参考商家进行排序。  Example embodiments of the present application, the server acquires the ranking queries submitted by a user of goods, with reference to the merchant providing the query obtaining merchandise goods according to the query; ranking server sends a query request to a social relationship social connections server to obtain the user to reference the merchant interpersonal distance; acquiring the reference evaluation value of the business; the user to interpersonal distance with reference to the merchant, and the reference evaluation value of the business, determining the reference merchant business relationship dimension ranking index; the reference merchant business relationship dimension ranking index, reference sort of business. 相对于现有技术，本申请实施例的排名服务器根据用户和参考商家人际距离的远近以及商家的评价值进行排名，将商家和用户人际距离因素对用户选择购物的参考价值进行了量化，提供了一种基于用户特性的排名方法。 Relative to the prior art, the ranking server embodiment of the present application are ranked according to distance and an evaluation value of interpersonal distance user and reference merchant business, the merchants and customers interpersonal distance factor Reference value shopping for user quantified, providing on a rating method based on user characteristics. 本实施例基于购买者到用户的人际距离的远近和购买者对商品的评价值计算商品的用户关系维度排名指数，基于提供该商品的商家到用户的人际距离的远近和该商家的评价值计算参考该商家的商家关系维度排名指数，综合考虑用户关系维度排名指数和商家关系维度排名指数对商品进行评价并排序。  The present embodiment calculates the product based on the evaluation value of the purchaser to the user's interpersonal distance distance and buyers for goods user relationship dimension ranking index, based on providing the merchant of the merchandise to the interpersonal distance of the user's distance and the merchant evaluation value is calculated with reference to the business relationship between the dimensions of the ranking index of the business, considering the dimensions of the relationship between the user and the business relations dimension ranking index ranking index of commodities evaluated and ranked. 其中，确定查询商品的用户关系维度排名指数的过程同步骤102-步骤105。  Among them, the process of determining the relationship between user queries commodity index ranking dimension with steps 102- 105 steps. 其中，确定商家的商家关系维度排名指数的过程同步骤202-步骤204。  wherein determining a business' ranking index relations dimension of the process steps with steps 202- 204. 步骤304，根据所述用户关系维度排名指数以及所述商家关系维度排名指数得到综合指数；  具体的，当上述用户关系维度排名指数为A，上述商家关系维度排名指数为B，可以如下公式得到综合指数：C = kl*A+k2*B，其中C为综合指数，kl, k2为权重系统，可以根据经验值设定。  Step 304, based on the user relationship and dimensions of the merchant ranking index ranking index obtained dimension relationship index;  Specifically, when the relationship between said user ranking index for the dimension A, the above-described relational dimension merchant ranking index B , the following equation can be obtained index: C = kl * A + k2 * B, where C is a composite index, kl, k2 is a weighting system, the value may be set empirically. 步骤305，根据所述综合指数对各查询商品进行排序。  Step 305, for each query sorting goods according to the index. 具体的，可以按照综合指数由大到小的顺序进行排名。  Specifically, it can be ranked in order of descending index. 对于具有相同平均评价值的两个商品，并且提供这两个商品的商家具有相同评价值，如果其中一个商品的综合指数较高，说明该商品更加受到用户的好友或用户所在的人际圈的好评，该商品更可能是被提交查询用户将要选择的结果。 Praise interpersonal circle with the same evaluation value for the business with the same average evaluation value of two goods, and provide both goods, if one of the higher commodity index, indicating that the product is more subject to the user's friends or the user is located the product is more likely to be a user submits a query result will be selected. 另外，也可以在本申请实施例提供的排名方法中结合现有的排名方法来进行排名，并根据权重因子的设定确定各种排名评价方法在最终排名结果中所占的权重。  Moreover, ranking may be implemented in conjunction with the method provided in the conventional methods to rank the rank in the present application, and determining the weight percentage of various evaluation methods ranking in the final re-ranking results in accordance with the set of weighting factors. 例如，根据排名服务器确定用户请求查询的各对象的用户关系维度排名指数，并获取现有排名方法中的网购平台维度指数，根据用户关系维度排名指数以及网购平台维度指数确定各对象的综合指数，从而根据各对象的综合指数对各对象进行排序。 For example, the ranking server to determine the user relational dimension ranking index of the objects requested by the user query and obtain online shopping platform dimension indices existing ranking methods according shopping platform dimension indices to determine the composite index of the objects according to user relational dimension ranking index and net, so each object according to sort index for each object. 在本申请提供的方法实施例中，排名服务器在根据各对象的用户关系维度排名指数，或各对象的商家关系维度排名指数，或各对象的综合指数对各对象进行排序之后，可以根据排序的结果，向发起查询的用户所在终端返回查询结果。  embodiment, the ranking server, after sorting each object according to a user relational dimension ranking index of each object, or business relationships dimension ranking index of each object, or index of each object, may be in the process provided herein Embodiment according to the results of the sort, query results returned to the terminal where the user initiates a query. 基于与上述方法实施例相同的技术构思，本申请实施例提供了一种排名服务器。  Based on the same technical concept of the above-described embodiment of the method embodiments, the present application provides a ranking server. 所述获取单元41根据社交关系服务器记录的用户属性，判断两个用户在用户属性上是否具有共性，并根据具有共性的用户属性来确定人际距离，其具有共性的用户属性越多，人际距离越小。  The attribute acquiring unit 41 according to a user's social relationships recording server determines whether the user has two at the common user attributes, and determines the interpersonal distance based on user attributes in common with the more common of which has the user attribute, interpersonal distance is smaller. 根据参考用户群中每个用户的人际距离，计算权重之后的评价值的平均值，从而得到用户关系维度排名指数。  The average value of the evaluation value after the distance weight is calculated with reference to the user group interpersonal each user, whereby the user relationship dimension ranking index. 用户关系维度排名指数=SUM(评价值/人际距离）/样本数。  user relational dimension ranking index = SUM (evaluation value / interpersonal distance) / number of samples. 本申请实施例中，排名服务器根据用户发起的查询请求,为所请求查询的各对象选取参考用户群；获取参考用户群中每个用户到发起所述查询请求的用户的人际距离，并获取参考用户群中每个用户对所请求查询的对象的评价值；根据获取到的人际距离和评价值，确定各对象的用户关系维度排名指数，并根据各对象的用户关系维度排名指数，对各对象进行排序，相对于现有技术，本申请实施例的排名服务器根据用户和参考用户人际距离的远近以及参考用户的评价值进行排名，将用户的社交圈的选择对用户选择购物的参考价值进行了量化，提供了一种基于用户特性的排名方法。  Example embodiments of the present application, according to the ranking server query request initiated by the user, a query for the requested object reference in the selected user groups; obtain the users to user groups each user initiating the query request of interpersonal distance, and obtains an evaluation value for each user object query requested with reference to the user group; according to the obtained interpersonal distance evaluation value, determining that the user relational dimension ranking index of each object, and the user of each object relational dimension ranking index, for each sort objects with respect to the prior art, the ranking server according to embodiments of the present application are ranked according to the distance the user and the users of interpersonal distance and the reference evaluation value of the user, the selected user circles a user selection of shopping reference value quantified, providing a ranking method based on user characteristics. 排序单元53，用于根据获取到的人际距离和参考商家的评价值，确定所述参考商家的商家关系维度排名指数，并根据参考商家的商家关系维度排名指数，对参考商家进行排序。  sorting unit 53, according to the obtained interpersonal distance evaluation values ​​of the reference and the merchant, the merchant determines the reference dimension ranking index business relationship, and dimensions in accordance with the business relationship with reference to the merchant ranking index, reference sorting business . 商家关系维度排名指数=评价值/人际距离。  business relations dimension evaluation ranking index = value / interpersonal distance. 策略三，排名服务器根据上述基于人际距离的排名方法确定用户请求查询的各对象的用户关系维度排名指数，根据上述基于人际距离的排名方法确定所述各对象所在的商家的商家关系维度排名指数；排名服务器根据用户关系维度排名指数和商家关系维度排名指数确定各对象的综合指数；或者，根据用户关度排名指数确定各对象的综合指数；或者，根据用户关系维度排名指数、商家关系维度排名指数，以及网购平台维度指数，确定各对象的综合指数。  Strategy three, ranking server above to determine the user relational dimension ranking index of the objects the user requests a query based on a ranking method interpersonal distance based, the determination based on a ranking method interpersonal distance according to business relations dimension of the business of each of the object is located ranking index; ranked server according to user relational dimension ranking index and business relations dimension ranking index composite index of each object; or determine the index of the objects according to user turns ranking index; or, according to user relational dimension ranking index, business relations dimensions ranking index, as well as shopping platform dimensions net index, the composite index is determined for each object. 上述服务器中，所述综合单元61确定对象的综合指数包括：对对象的用户关系维度排名指数，商家关系维度排名指数，以及网购平台维度指数进行加权求和后得到该对象的综合指数。  In the above-described server, the integration unit 61 determines the object index comprising: a user relationship dimension ranking index of the object, the business relationship between the dimension index ranking, and available internet web dimension index index obtained after the weighted summation of the object . 在本申请实施例的排名服务器中，还可以包括：响应单元，用于根据所述排序单元排序的结果，向发起查询的用户返回查询结果。  In the present embodiment the ranking server application may further comprise: response means for sorting according to a result of the sorting unit, returns a query result to the user initiating the query. 本领域技术人员可以理解实施例中的装置中的模块可以按照实施例描述进行分布于实施例的装置中，也可以进行相应变化位于不同于本实施例的一个或多个装置中。  Those skilled in the art will be appreciated apparatus embodiment that the modules can be distributed in accordance with an embodiment of the apparatus of the embodiment may be performed according to the present embodiment which are different from one case or more devices. 上述实施例的模块可以合并为一个模块，也可以进一步拆分成多个子模块。 Modules of the embodiments may be combined into one module, or split into multiple submodules. 通过以上的实施方式的描述，本领域的技术人员可以清楚地了解到本申请可借助软件加必需的通用硬件平台的方式来实现，当然也可以通过硬件，但很多情况下前者是更佳的实施方式。  By the above described embodiments, those skilled in the art can understand that the present application may be implemented by software plus a necessary universal hardware platform, also be implemented by hardware, but the former is in many cases more good embodiments. 基于这样的理解，本申请的技术方案本质上或者说对现有技术做出贡献的部分可以以软件产品的形式体现出来，该计算机软件产品存储在一个存储介质中，包括若干指令用以使得一台终端设备（可以是手机，个人计算机，服务器，或者网络设备等）执行本申请各个实施例所述的方法。 Based on such understanding, the technical solutions of the present application or the nature of the part contributing to the prior art may be embodied in a software product, which computer software product is stored in a storage medium and includes several instructions to enable a terminal devices (which may be a mobile phone, a personal computer, a server, or network device) according to the method of Example of the present application performed various embodiments. 以上所述仅是本申请的优选实施方式，应当指出，对于本技术领域的普通技术人员来说，在不脱离本申请原理的前提下，还可以做出若干改进和润饰，这些改进和润饰也应视本申请的保护范围。  The above are only preferred embodiments of the present application, it should be noted that those of ordinary skill in the art, in the present application without departing from the principles of the premise, can make various improvements and modifications, such modifications and modifications should also depend on the scope of the present disclosure. 1. 一种基于人际距离的排名方法，其特征在于，包括： 排名服务器根据用户终端发起的查询请求，获取请求查询的各对象，并获取查询的各对象对应的参考用户群； 排名服务器获取参考用户群中每个用户到发起所述查询请求的用户的人际距离，并获取参考用户群中每个用户对所请求查询的对象的评价值； 排名服务器根据获取到的人际距离和评价值，确定各对象的用户关系维度排名指数，并根据各对象的用户关系维度排名指数，对各对象进行排序。 A method based on a ranking of interpersonal distance, characterized by comprising: ranking server according to the query request initiated by the terminal user, each object acquisition request query, the query and obtains each object reference corresponding to a user group; ranking server retrieves reference each user group to the user initiating the query interpersonal distance user request, and obtains an evaluation value for each user query requested object reference in the user group; ranking server according to the obtained interpersonal distance evaluation value is determined users relational dimension index ranking each object and relational dimension ranking index based on the user of each object, each object is sorted. 2.如权利要求I所述的方法，其特征在于，所述获取查询的各对象对应的参考用户群包括： 根据预设的参考用户群的样本数，选取最近购买了所述对象的相应数量的用户组成参考用户群；或， 根据预设的参考用户群的样本数，选取最近对所述对象表示了购买意愿的相应数量的用户组成参考用户群；或， 根据预设的参考用户群的样本数，按照设定比例选取最近购买了所述对象的用户以及最近对所述对象表示了购买意愿的用户组成参考用户群。 2. The method of claim I, wherein each of the obtaining of the corresponding reference object query user group comprising: the number of samples in accordance with a preset reference user group, the selected object recently purchased a corresponding number the composition of the users user group; or, according to a preset number of samples of the users group, selected recently expressed willingness to buy a corresponding number of users consisting of the users of the group of objects; or, according to a predetermined reference group of users the number of samples according to a set ratio of the selected object recently purchased and the user has recently expressed willingness to buy the object user group consisting of the users. 3.如权利要求I所述的方法，其特征在于，所述排名服务器获取各参考用户群中每个用户到发起所述查询请求的用户的人际距离，包括： 所述排名服务器从社交关系服务器获取用户的好友关系信息，根据获取到的好友关系信息确定各参考用户群中每个用户到发起所述查询请求的用户的人际距离；或所述排名服务器根据社交关系服务器记录的用户属性，判断两个用户在用户属性上是否具有共性，并根据具有共性的用户属性来确定人际距离，其具有共性的用户属性越多，人际距离越小。 3. The method of claim I, wherein said interpersonal distance ranking server acquires the user group for each user with reference to each user initiates the query request, comprising: a social relationship from a server on the ranking server get the user's buddy relationship information, the information is determined according to the obtained relationship of the users of the group of friends each user to initiate a user interpersonal distance of the query request; or the server based on user attributes ranked social relationships server records, determined user has two at the common user attributes, and determines the interpersonal distance based on user attributes in common with the more common of which has the user attribute, the smaller the interpersonal distance. 4.如权利要求I所述的方法，其特征在于，根据人际距离设置权重系数，该权重系数随着人际距离的增大而减小； 所述根据各参考用户群中每个用户到发起所述查询请求的用户的人际距离，以及参考用户群中每个用户对所述对象的评价值，计算用户关系维度排名指数包括： 根据参考用户群中每个用户的人际距离，计算权重之后的评价值的平均值，从而得到用户关系维度排名指数。 4. The method of claim I, wherein the weight coefficient is set according to the weight interpersonal distance, the weighting coefficients are increased interpersonal distance decreases; according to the reference of each user to each user group to initiate the interpersonal distance of said user query request, and with reference to the user group evaluation value for each user of the object, calculating user relationship dimension ranking index comprising: a commentary after the reference user group interpersonal each user distance, calculates the weight the average value, resulting in user relational dimension ranking index. 5.如权利要求I所述的方法，其特征在于，所述计算用户关系维度排名指数的公式为： 用户关系维度排名指数=SUM(评价值/人际距离）/样本数。 5. The method of claim I, wherein the user relationship calculated ranking index for the dimension: Dimension user relationship ranking index = SUM (evaluation value / interpersonal distance) / number of samples. 6.如权利要求3所述的方法，其特征在于，所述社交关系服务器存储如下内容中的一项或多项， 邮箱服务系统中的用户及用户好友关系；社交网络服务网站中的用户及用户好友关系；即时通信系统中的用户及用户好友关系；网络游戏平台中的用户及用户好友关系；基于用户关系的信息分享、传播以及获取平台中的用户及用户好友关系；电子商务网站中的用户及用户好友关系。 6. The method according to claim 3, wherein said server stores a social relationship or more of the following, mail service system users and their friendship; social networking site users and users friendship; the relationship between the user and the user's friends instant messaging system; the relationship between the user and the user's friends network game platform; share information based on user relations, dissemination and access platform users and their friendship; e-commerce website users and user friendship. 7. 一种基于人际距离的排名方法，其特征在于，包括： 排名服务器根据用户终端提交的查询请求，确定所请求查询的各对象各自所在的参考商家；排名服务器获取发起所述查询请求的用户到参考商家的人际距离，并获取所述参考商家的评价值； 排名服务器根据获取到的人际距离和参考商家的评价值，确定所述参考商家的商家关系维度排名指数，并根据参考商家的商家关系维度排名指数，对参考商家进行排序。 A method based on a ranking of interpersonal distance, characterized by comprising: ranking server according to the query request submitted by the user terminal, the merchant determines the reference of each respective query requested object is located; ranking server obtains the user initiates the query request the interpersonal distance reference merchant, and acquires evaluation values ​​of the reference merchant; ranking server according to the evaluation values ​​obtained interpersonal distance and the reference merchant, determining the reference merchant business relationship dimension ranking index, and the merchant with reference to the merchant according to the relational dimension ranking index, sort of reference business. 8.如权利要求7所述的方法，其特征在于，所述排名服务器获取发起所述查询请求的用户到参考商家的人际距离，包括： 所述排名服务器从社交关系服务器获取用户的好友关系信息，并根据获取到的好友关系信息确定发起所述查询请求的用户到参考商家的人际距离；或所述排名服务器从交易数据库获取发起所述查询请求的用户和参考商家的交易次数以及交易成功率，并根据获取到的交易次数以及交易成功率确定用户和参考商家之间的人际距离。 8. The method according to claim 7, wherein said ranking server acquires a user initiates the query request to the merchant with reference to the interpersonal distance, comprising: a ranking server obtains user information from a buddy relationship social connections server and according to the obtained information to determine the relationship between friends launched a user query request to the interpersonal distance reference business; or the ranking server to obtain a user initiates the query request and refer business transactions and transaction success rate from the transaction database and to determine the interpersonal distance between the user and the reference to businesses acquired in accordance with the number of transactions and transaction success rate. 9.如权利要求7所述的方法，其特征在于，确定参考商家的商家关系维度排名指数的公式为： 商家关系维度排名指数=评价值/人际距离。 9. The method according to claim 7, characterized in that the business relationship is determined with reference to the dimensions of the merchant ranking index formula: Dimension business relationship evaluation values ​​ranking index = / interpersonal distance. 10. 一种基于人际距离的排名方法，其特征在于，包括： 排名服务器接收用户终端发起的查询请求，获取请求查询的各对象，确定各对象的综合指数； 排名服务器根据各对象的综合指数对各对象进行排序； 其中，排名服务器根据如下策略中的一种确定各对象的综合指数： 策略一，排名服务器根据如权利要求1-6中任一项所述的基于人际距离的排名方法确定用户请求查询的各对象的用户关系维度排名指数，并根据用户关系维度排名指数以及网购平台维度指数，确定各对象的综合指数； 策略二，排名服务器根据如权利要求7-9中任一项所述的基于人际距离的排名方法确定所述各对象所在的商家的商家关系维度排名指数；并根据商家关系维度排名指数以及网购平台维度指数，确定各对象的综合指数； 策略三，排名服务器根据如权利要求1-6中任一项所述的基 10. A method of ranking based on interpersonal distance, characterized by comprising: ranking server receives a query request initiated by the terminal user, each object acquisition request query index is determined for each object; server according to the ranking of each object index sorting each object; wherein the server determines the ranking of each index object in accordance with one of the following strategies: a policy, the user ranking is determined based on a ranking server interpersonal distance method according to claim any one of claims 1-6 each object query request user relationship dimension ranking index, and relation dimension ranking index according to a user online shopping platform and dimension indices, index of each object is determined; strategy II, according to the ranking server as claimed in any one of the claims 7-9 determined based on the ranking methodology interpersonal distance business of the respective object resides business relations dimension ranking index; and according to the business relationship between the dimensions of ranking index as well as online shopping platform dimension indices to determine the composite index of the objects; strategy three, ranking server according to claim yl claim any one of claims 1-6 于人际距离的排名方法确定用户请求查询的各对象的用户关系维度排名指数，根据如权利要求7-9中任一项所述的基于人际距离的排名方法确定所述各对象所在的商家的商家关系维度排名指数；排名服务器根据用户关系维度排名指数和商家关系维度排名指数确定各对象的综合指数；或者，根据用户关系维度排名指数、商家关系维度排名指数，以及网购平台维度指数，确定各对象的综合指数。 Each object is determined in the user request query ranking methodology user relationship interpersonal distance dimension ranking index, according to any one of claims 7-9 merchant determines the rank of each object is located based on the interpersonal distance method as claimed in claim business relational dimension ranking index; ranked server to determine the composite index of the objects according to user relational dimension ranking index and business relations dimension ranking index; or, according to user relational dimension ranking index, the business relationship between the dimensions of ranking index, as well as shopping platform dimensions net index, determines how objects the composite index. 11.如权利要求10所述的方法，其特征在于，确定对象的综合指数，包括： 对对象的用户关系维度排名指数，商家关系维度排名指数，以及网购平台维度指数进行加权求和后得到该对象的综合指数。 Weighted summation of the user relationship dimension ranking index of the object, the business relationship between the dimension index ranking, and available internet web dimension index: 11. The method according to claim 10, wherein determining the index object, comprising composite index object. 12. 一种信息搜索方法，其特征在于，包括： 排名服务器接收用户终端发起的查询请求，获取请求查询的各对象，对各对象进行排序; 排名服务器根据排序的结果，向发起查询的用户终端返回查询结果； 其中，所述对各对象进行排序包括：排名服务器根据如权利要求1-6中任一项所述的基于人际距离的排名方法确定用户请求查询的各对象的用户关系维度排名指数，并根据各对象的用户关系维度排名指数，对各对象进行排序；或， 根据如权利要求7-9中任一项所述的基于人际距离的排名方法确定所述各对象所在的商家的商家关系维度排名指数，并根据各对象所在的商家的商家关系维度排名指数，对各对象进行排序；或， 根据如权利要求10-11中任一项所述的基于人际距离的排名方法确定各对象的综合指数，并根据各对象的综合指数，对各对象进行排序。 12. An information search method, characterized by comprising: ranking server receives a query request initiated by the terminal user, each object acquisition request query for sorting each object; a user terminal according to the result sorted ranking server, to initiate a query returning query results; wherein said sorting each object comprises: ranking server user relationship dimension ranking index for each object based on the user request query is determined based on a ranking of claims 1-6 interpersonal distance a method as claimed in claim and ranking index according to a user dimension relation of each object, for each object sorting; or according to any of the respective objects 7-9 merchant determines where a ranking based on the interpersonal distance method as claimed in claim business relationship between the dimension index ranking, according to the business relationship between the dimensions of each object where the merchant ranking index for each object sorting; or, each object is determined according to any one of claim 10-11 interpersonal distance based on a ranking method as claimed in claim the composite index, and the composite index based on each object, each object is sorted. 13. —种排名服务器,其特征在于,包括： 获取单元，用于根据用户终端发起的查询请求，获取请求查询的各对象，并获取查询的各对象对应的参考用户群； 所述获取单元，还用于获取参考用户群中每个用户到发起所述查询请求的用户的人际距离，并获取参考用户群中每个用户对所请求查询的对象的评价值； 排序单元，用于根据获取到的人际距离和评价值，确定各对象的用户关系维度排名指数，并根据各对象的用户关系维度排名指数，对各对象进行排序。 13. - kind of ranking server, characterized by comprising: an obtaining unit, configured to query request initiated by the terminal user, each object acquisition request query, the query and obtains each object reference corresponding to a user group; the acquisition unit, further configured to obtain a reference to each user in the user group a user initiates the query request of interpersonal distance, and obtains an evaluation value for each user group the users query requested object; a sorting unit according to obtain interpersonal distance evaluation value and determine the user relational dimension index ranking each object and relational dimension ranking index based on the user of each object, each object is sorted. 14.如权利要求13所述的服务器，其特征在于，根据获取单元获取的人际距离设置权重系数，该权重系数随着人际距离的增大而减小； 所述排序单元根据各参考用户群中每个用户到发起所述查询请求的用户的人际距离，以及参考用户群中每个用户对所述对象的评价值，计算用户关系维度排名指数包括： 根据参考用户群中每个用户的人际距离，计算权重之后的评价值的平均值，从而得到用户关系维度排名指数。 14. The server according to claim 13, wherein the acquiring unit acquires The interpersonal distance weighting coefficient set weights, the weighting coefficients are increased interpersonal distance decreases; the sorting unit according to each of the users group each user of the user to initiate a query request interpersonal distance, and the reference evaluation value for each user group of the subject user, calculating a user ranking index relational dimension comprising: a reference to the user group interpersonal distance to each user's , the average evaluation value is calculated after the weights, whereby users relational dimension ranking index. 15.如权利要求13-14中任一项所述的服务器，其特征在于，所述服务器还包括，响应单元，用于根据所述排序单元排序的结果，向发起查询的用户终端返回查询结果。 15. The server according to any one of claims 13-14 claims, characterized in that said server further comprises a response means for sorting according to a result of the sorting unit, returns a query result to the user terminal initiates query . 16. —种排名服务器,其特征在于,包括： 确定单元，用于根据用户终端提交的查询请求，确定所请求查询的各对象各自所在的参考商家； 获取单元，用于获取发起所述查询请求的用户到参考商家的人际距离，并获取所述参考商家的评价值； 排序单元，用于根据获取到的人际距离和参考商家的评价值，确定所述参考商家的商家关系维度排名指数，并根据参考商家的商家关系维度排名指数，对参考商家进行排序。 16. - kind of ranking server, characterized by comprising: a determining unit, configured to query the user terminal according to the submitted request, the merchant determines the reference of each respective query requested object is located; acquiring unit for acquiring the query request to initiate interpersonal distance to user reference merchant, the merchant and acquiring the evaluation reference value; sorting unit according to the evaluation value acquisition and interpersonal distance reference merchant, the merchant determines the reference dimension ranking index business relationship, and according to the business relationship between the dimensions of the reference index ranking of business, sort of reference business. 17.如权利要求16所述的服务器，其特征在于，所述服务器还包括，响应单元，用于根据所述排序单元排序的结果，向发起查询的用户终端返回查询结果。 17. The server according to claim 16, wherein said server further comprises a response means for sorting according to a result of the sorting unit, the user initiates the query results returned by the query terminal. 18. —种排名服务器,其特征在于,包括： 综合单元，用于接收用户终端发起的查询请求，获取请求查询的各对象，确定各对象的综合指数； 排序单元，用于根据各对象的综合指数对各对象进行排序； 其中，所述综合单元具体用于根据如下策略中的一种确定各对象的综合指数： 策略一，排名服务器根据如权利要求1-6中任一项所述的基于人际距离的排名方法确定用户请求查询的各对象的用户关系维度排名指数，并根据用户关系维度排名指数以及网购平台维度指数，确定各对象的综合指数； 策略二，排名服务器根据如权利要求7-9中任一项所述的基于人际距离的排名方法确定所述各对象所在的商家的商家关系维度排名指数；并根据商家关系维度排名指数以及网购平台维度指数，确定各对象的综合指数； 策略三，排名服务器根据如权利要求1-6中任一项所述 18. - kind of ranking server, characterized by comprising: an integrated unit, for receiving query request initiated by a user terminal, obtaining a query request each object, each object index is determined; sorting unit for each object according to the comprehensive index sort each object; wherein the integrated unit is configured to determine the index of each object in accordance with one of the following strategies: a strategy, based on a ranking server according as claimed in claims 1-6 ranking method of interpersonal distance that determines how objects requested by the user queries the user relational dimension ranking index, and according to user relational dimension ranking index as well as online shopping platform dimension indices to determine the composite index of the objects; strategy II, ranking server according to claim 7- 9 is determined according to any one of the ranking method based on interpersonal distance of the business of each object it is located in the business relationship between the dimensions of ranking index; and according to the business relationship between the dimensions of ranking index and online shopping platform dimension indices, the composite index is determined for each object; strategy Third, according to the ranking server as claimed in any one of claims 1-6 基于人际距离的排名方法确定用户请求查询的各对象的用户关系维度排名指数，根据如权利要求7-9中任一项所述的基于人际距离的排名方法确定所述各对象所在的商家的商家关系维度排名指数；排名服务器根据用户关系维度排名指数和商家关系维度排名指数确定各对象的综合指数；或者，根据用户关系维度排名指数、商家关系维度排名指数，以及网购平台维度指数，确定各对象的综合指数。 Each object is determined based on the user request query ranking methodology user relationship interpersonal distance dimension ranking index, determined according to any of merchants 7-9 of the respective object is located based on a ranking of the interpersonal distance method of claim business relational dimension ranking index; ranked server to determine the composite index of the objects according to user relational dimension ranking index and business relations dimension ranking index; or, according to user relational dimension ranking index, the business relationship between the dimensions of ranking index, as well as shopping platform dimensions net index, determines how objects the composite index.